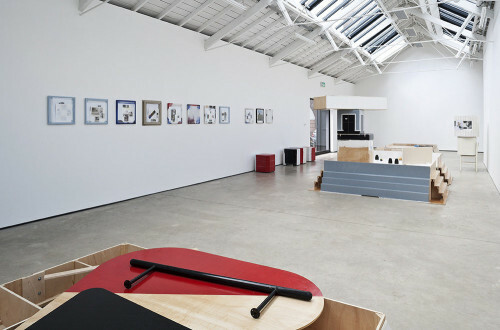 The Modern Institute is a must-visit gallery in Glasgow, Scotland. With ties to artists as diverse as Chris Johanson, Urs Fischer, or Cathy Wilkes, the Institute hosts quarterly exhibitions with enough hands-off curation to allow real focus on a single artist’s crafted imagination. When I visited the city in August, I was able to see Manfred Pernice’s «anexos»LOCAL, a one-room installation of sculptures and collages, each part of a larger interest in containers – shipping containers, design wrappings, commodity packaging, and so on. Pernice’s sculptural inquiry took the form of designs that seemed to peel open to reveal the fuzzy boundry between their insides and outsides, conflating the material qualities of what is contained with those of what contains it. The sculptures were rich with detail, common in material, and with plenty of pre-fab nods: some looked like half-constructed IKEA furniture, others like woefully abstract senior design projects. 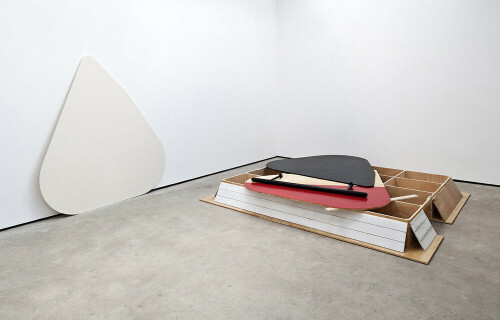 While the eleven wall-mounted collages suggested diagrams, plans, or sketches, the floor works skated narrative as (rather tired by now) relation-of-objects tableaus. 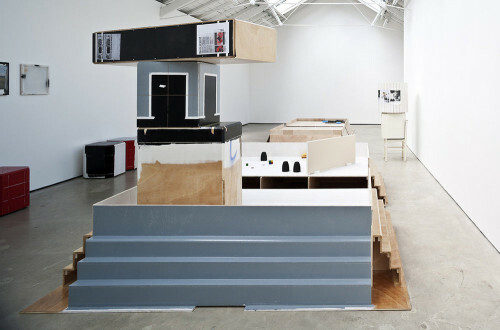 In one “cassette” (Pernice’s word for the bisected pallet-like structures evenly placed along Institutes ground-floor gallery), a low step-pyramid of carefully hewn plywood offers up a few bottlecaps, colored blocks, and a dented can on one side; on the other, a stack of boxes half-painted and half-plastered with Spanish news articles, detailing the disposal of trash. Even with the “moment” quality of the work in time – either having been opened, or in the process of some construction – these narrative qualities were too extraneous, and not clear or significant enough to move my attention from the materials or forms. What these objects did do, however, was introduce value: what was so significant about these random objects, and what kind of value did they have to the artist (or the viewers), to require such an elaborate container? As much as I enjoyed this work by Manfred Pernice, I was also impressed by The Modern Institute’s role in the region’s contemporary art economy. While not a large space (though the Institute has a second nearby), it seems to provide the opportunity for well-known artists to experiment with exhibitions, perhaps in a more liberal way than a museum would require, and in a manner unusual for commercial galleries. I can’t quite nail it down, but there was an attitude of consolidation rather than advocacy, letting formerly established artists exhibit not just the work that earned their notoriety, but their ability to invent and create. Superior thinking desmtonrated above. Thanks!